A recent addition to the Dassault Systemes Dymola portfolio is the Motorsports library, developed by Claytex. 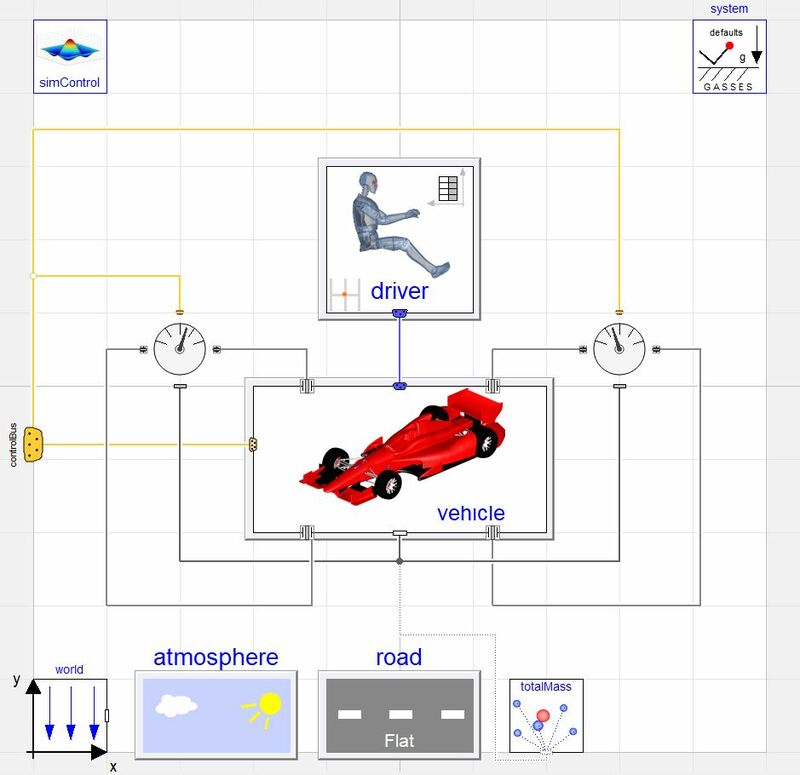 The Motorsports library is part of the Vehicle Systems Modelling and Analysis (VeSyMA) solution which is a set of Modelica libraries for vehicle simulation. The Motorsports library contains models for open wheel race cars, sports cars, and NASCAR style vehicles. 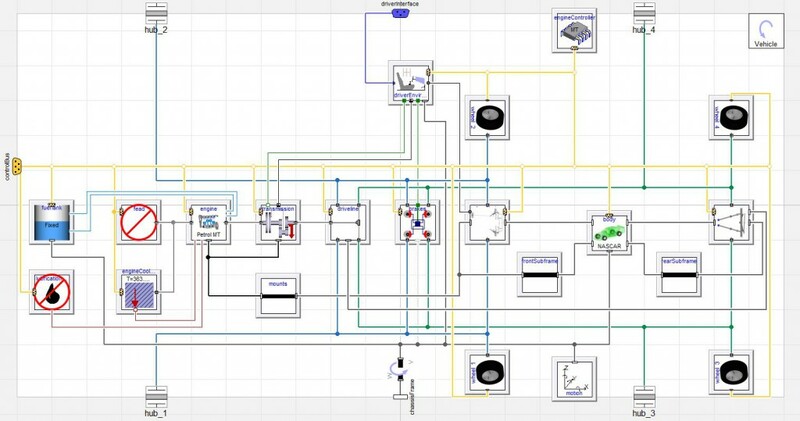 It is built on the core VeSyMA and VeSyMA – Suspensions libraries in conjunction with the Modelica Standard Library. Figure 1: Quick peak at some of the VeSyMA – Motorsports library structure. Professional motorsports teams all over the world use Claytex libraries / training to move their simulation capabilities forward. The Motorsport library provides example vehicle models and experiments that are intended to create a platform from which motorsports engineers can build / customise their own simulations. Figure 2: IndyCar mass check experiment layout. The vehicle models in the motorsports library are structured to conform to the vehicle interface standard templates set forth in the open source Vehicle Interfaces library. Figure 3: NASCAR vehicle layout, conforming to the open source Vehicle Interfaces library standard. Double wishbone suspension arrangements with pushrod/pullrod or directly actuated spring-dampers. 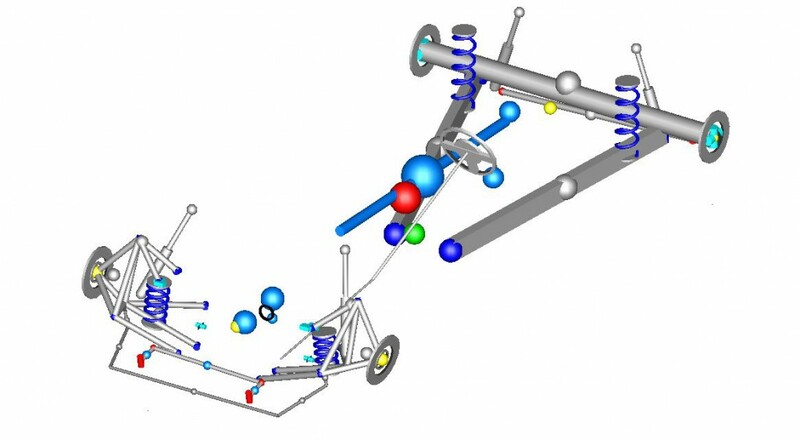 NASCAR rear truck arm suspension arrangement. Adjustment shims incorporated into the suspension for realistic setup of the vehicle. Setup calculation experiments, where adjustments can be either applied in parallel or in sequence. 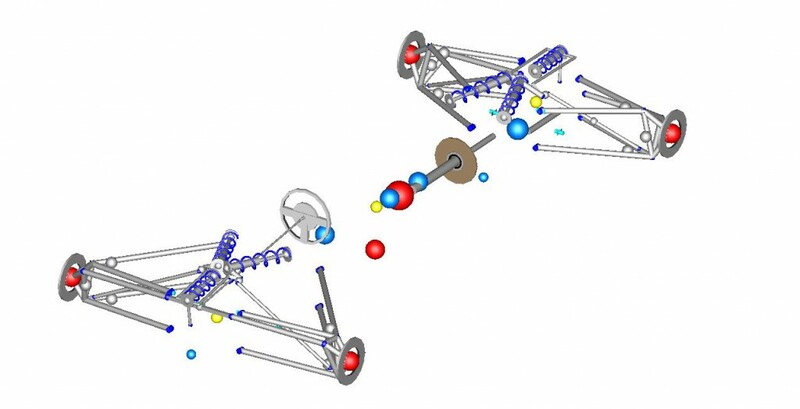 Suspension models optimised to minimise non-linear systems of equations for real-time simulation. Pacejka tire models with aerodynamic effects incorporated. Aerodynamic models for a race car body and wings. Figure 4: IndyCar suspension assembly. The vehicle models in the Motorsports library are optimised to run in real-time and are designed to be able to port directly into a driving simulator. 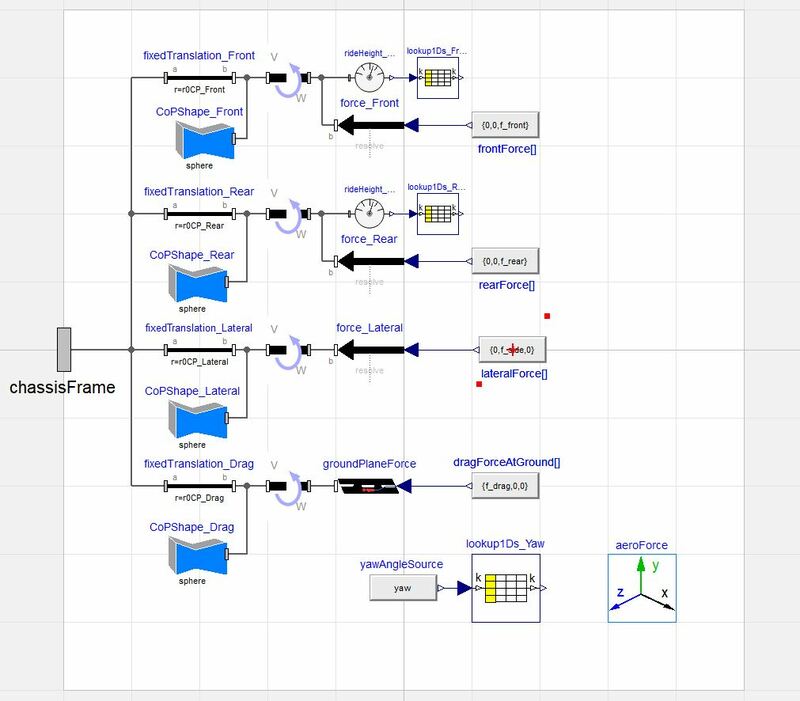 The VeSyMA – Driver-in-the-Loop Library is also available to aide in deploying these models or models based on these models to either a PC based static workstation simulator or a full moving platform driving simulator. Figure 5: NASCAR suspension assembly. Example vehicles included in the Motorsports library demonstrate a well-structured starting point from which Motorsports engineers can begin developing their own simulation vehicles / experiments. Example experiments commonly used in motorsport are also provided which range from setup routine simulations to rig tests all the way to closed loop driver models driving the vehicle on a defined course. Figure 6: Formula student vehicle simulation – K&C rig roll test. Examples of many sub systems that are highly important to motorsports engineers are available to provide examples of how to make them work. For example, figure 7 contains that of an aerodynamic model. Figure 7: Aerodynamic Model Example. The Motorsports library along with some training can get a simulation engineer on a motorsports teams up and running quickly and on their way to managing their own Dymola based in-house simulation infrastructure. Please feel free to contact sales@claytex.com to get more information on the VeSyMA – Motorsports Library.